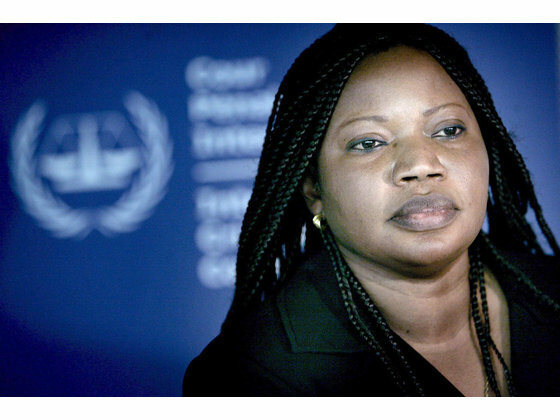 International Criminal Court prosecutor Fatou Bensouda has said she has evidence of bribery of a key witness in the Deputy Prime Minister Uhuru Kenyattaâ€™s case. In her submissions, Ms Bensouda claims the critical Witness Four, a former Mungiki leader, who withdrew his testimony after the confirmation hearings was paid to do so. This is the witness who said he was present at meetings in State House and the Nairobi Club where Mr Kenyatta and former head of Public Service Francis Muthaura allegedly planned violence. In a later statement to the ICC, the witness said he lied about his presence in the two meetings. â€œWitness Four revealed in an interview in May 2012 that he had been offered and accepted money from individuals holding themselves out as representatives of the accused to withdraw his testimony and provided e-mails and records that confirmed the bribery scheme,â€ said the prosecutor. Ms Bensouda was responding to an application by Mr Kenyattaâ€™s and Mr Muthauraâ€™s defence calling for dismissal of the case because of the withdrawal of evidence by the key witness. Mr Kenyatta, the Jubilee Alliance presidential candidate and his running mate, Mr William Ruto, are charged with crimes against humanity. The other accused is journalist Joshua arap Sang. The prosecution maintains that despite the withdrawal of the testimony, it had sufficient evidence of Mr Kenyattaâ€™s alleged participation in violence planning meetings at Blue Post Hotel in Thika and Nairobiâ€™s Yaya Centre. According to Ms Bensouda, the prosecution also has direct evidence showing Mr Kenyatta financed Mungiki youth for retaliatory attacks and his alleged phone call to Mungiki founder Maina Njenga who was then in prison. The prosecution argues that it has more evidence against the accused that was collected after the confirmation hearing. â€œThe fact that evidence relied by the Pre-Trial Chamber is withdrawn or new evidence is substituted cannot be sufficient to require a new confirmation process,â€ said the prosecutor. She argues that the law allows the prosecution to withdraw or add evidence after the confirmation hearing. Mr Kenyattaâ€™s defence has asked the court to return the case to the Pre-Trial Chamber, saying it would not have been confirmed without the recanted evidence. But the prosecution says even without Witness Four, the evidence relied upon by the Pre-Trial Chamber at the confirmation stage was sufficient to commit Mr Kenyattaâ€™s case to trial. However, Ms Bensouda has no problem if Mr Muthauraâ€™s case was referred to the pre-trial judges for review following the development. Ms Bensouda also clarified that they had not withdrawn allegations that Mr Kenyatta attended a meeting at State House and at Nairobi Club. The defence teams accepted to have committed an error for failure to produce Witness Fourâ€™s recanting testimony to the pre-trial judges. I very lucky to find this site on bing, just what I was looking for likewise saved to favorites. Watching but these guys have monet that can buy Kenya and ICC combined and still have change…..Only God can Stop. Otherwise Status Quo is Aluta Continua in Kenya!